I know artichokes don’t exactly scream comfort food, but I’ve found a lot of comfort in them lately, especially when they’re grilled. As you know, back in April I (along with my friend/coworker/future business partner) was laid off from the agency I had been with for almost four years. As most people realize at some point after getting laid off, it was the best thing to ever happen to me. Not only do I have way less stress in my life, I’m just…happier. Sadly, that thrill and excitement went away, at least temporarily, because three weeks after we were laid off, my friend took his own life, leaving behind two little kids. Marc had suffered with depression most of this adult life, but none of us knew the extent of his horrible disease. Marc was an incredibly devoted dad, a successful marketer, and an all around good, kind person. In attempt to take my mind off things, I went to Pinterest (naturally) and discovered you could grill an artichoke. What? Being in an apartment and sans BBQ, I decided to attempt this using my grill pan. Fortunately, it was a success, and even though my apartment was filled with smoke, my smoke detector didn’t go off and my neighbors were not alarmed. Aside from the amazing flavor the grill gives to the artichoke, it is possible that the best part of this recipe is the lemon garlic butter dipping sauce. I mean, we all know that artichokes really are just a vehicle for inhaling that stuff, right? Finally, for some reason, in our society there is a negative stigma attached to talking about depression; that needs to change. Talk about it. Give hugs. Make that phone call or send that email to check in on a friend. And the next time you eat an artichoke, think about Marc and others like him who are still suffering from depression. With a serrated knife, cut artichokes into quarters and using kitchen shears, cut sharp tips of leaves off. Scoop out the prickly center part of the artichoke, and discard. Immediately rub the cut side of the artichoke with a lemon half to help avoid yellowing. Place artichokes in a large stockpot filled with cold water. Add garlic cloves. Squeeze the juice of the lemon into the water and add the leftover lemon skin/peel to the water. Bring artichokes to a boil, reduce to simmer and cook for 20-25 minutes or until artichoke leaves easily pull from the head and the bottoms of the artichokes are tender. 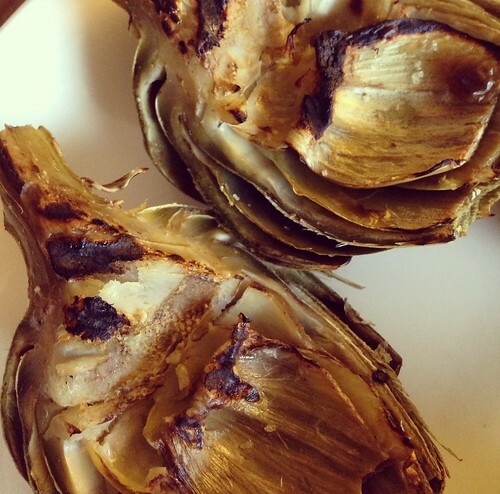 When grill is hot, place artichokes on grill and cook for 3 minutes each side or until nice grill marks appear. Remove and serve immediately or at room temperature with garlic lemon butter. Melt the butter in a small saucepan over low heat. Remove from heat and allow the solids to cool slightly, then skim the fat solids from the clear butter below and discard the solids. Add lemon zest, garlic cloves, and kosher salt and cook on medium until garlic browns slightly and becomes aromatic, about 5 minutes. Recipe adapted from Go Bold With Butter.